During the holidays, only one thing is certain: you will be eating, at a table, with other humans. (That, and Uncle Frank is going to get schwasted.) We're sure you, a gentleman, already know proper dining etiquette. But before breaking bread this holiday season, why not freshen up on the basics? Read on for common questions (and answers!) about tableside manners this holiday season. Seriously, what’s with all these forks? In a banquet setting, you’ll face an embarrassment of cutlery at the table. But it’s easy to avoid embarrassment yourself: just start from the outside and work your way in. First fork is for first course. The dinner fork comes next, and knives work the same way. Yes, there’s a “salad knife”—accept it. Anyway, the big spoon is for soup (and for cuddling) and your dessert and tea cutlery always sit above your plate. Is this glass mine? Maybe I’ll just go thirsty. At a round table it can be hard to tell where one place setting ends and another begins. So try this: touch your index finger to your thumb with your right hand. You just made a lowercase “D,” as in “drink.” So yes, that’s your glass on the right, go ahead and take a swig before Frank demolishes the rest of that Pinot Noir. Now try the same action with your left hand. It’s a “B,” as in “bread.” That’s what that little plate is for, and it belongs to you. What are the ways of the napkin? When you sit down in a restaurant, immediately place your napkin in your lap. Don’t tuck it into your pants or shirt. (We’re not sure why people do this.) And don’t use your napkin as a tissue at the table; if you need to blow your nose, go find the nearest sneezing shed. If you do leave the table temporarily, leave your napkin on your chair seat, not the table. A waiter might fold it neatly in your absence. At a fancy place, he might turn it into an origami swan. Your mileage may vary. Did you know: In England they call a napkin a serviette? Try that in your best Cumberbatch impression for extra points. How do I set a table? “Left” has four letters just like “fork.” Put your fork on that side. “Right” has five letters. So do “spoon” and “knife.” You do the math. The napkin can either go on the left (with your fork), or folded neatly on top of a plate. Is it that bad to use my phone at the table? Yes. Nothing screams “I lack restraint” like sweating over which filter to use on a bowl of cranberry sauce. You don’t need to live-tweet family hangs, so turn your smartphone off. Yeah, yeah, IRL conversation is so 2004, but once a year isn’t too often to come up for air and enjoy the company of flesh-and-blood humans. When do I start eating, really? Larger tables have different rules. One should still try to wait—lest you’re caught inhaling turkey during a toast—but if a host tells you to start eating, start eating. 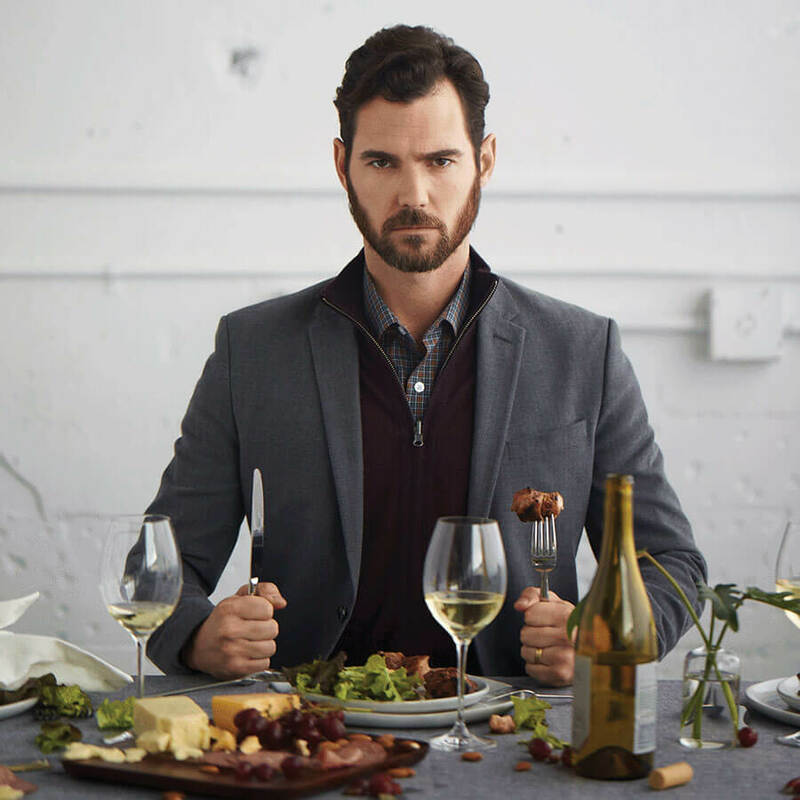 At a dinner party, always follow the host’s lead. Should I pull out my boo’s chair? In the days of old (before Friendster even), men would stand when a lady left the table. They also doffed their hats and used words like “golly.” None of this behavior is wrong, but pulling the chair out can be considered old fashioned. Always be polite, but don’t overdo it. Should I be eating in the continental style? If you’ve mastered all of the above, and find yourself wearing a cravat, you might be ready for some next-level knife-and-forking. American: cut your food into pieces, rest your knife on the plate, and swap your fork to the right hand to eat. Salute the flag occasionally. Continental: no switching. Your fork remains in your left hand and you eat with the tines of your fork facing down. (Don’t ask how this works for peas.) Also, don’t ever put down your knife. This is said to be a holdover from the era of dragons. It’s completely unnecessary, but it’ll have your family wondering if you “summer” in Monaco. It’s OK to bend the truth in this case: it’s the holidays. Have any questions or your own tips about etiquette? Let us know in the comments below.